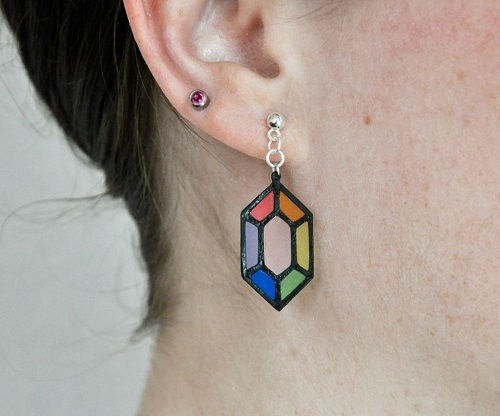 Real stained glass earrings have one major drawback - the weight! So something lighter would be better. 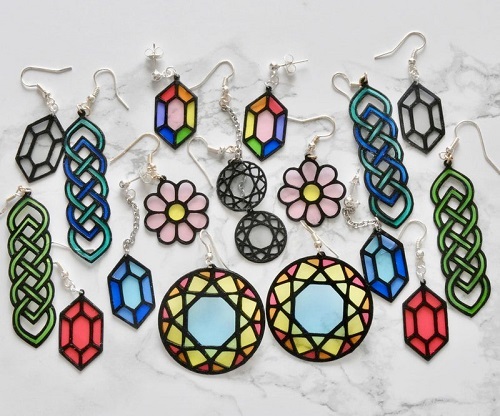 Penolopy Bulnick spent a while exploring possible materials to use for her faux stained glass earrings tutorial. The black is just black cardstock. After some attempts at more expensive options, the solution for the colored parts was just transparent file folders! The tutorial is an assemblage one. You cut out the shapes and glue them together. Two black cut outs are needed to sandwich the colored bits. You are also not limited to stained glass designs!! You can do this by hand if you are good with an Xacto-knife. But it is much, much easier with an electronic die cutter! Precision cutting. Examples of die cutters include the Cricut (which I have), the Silhouette which is what the instructor has. Penolopy has shared only the cutting file for the Silhouette. I wish she had created the more universal svg format which is a scaleable vector image. But you can easily create your own patterns if you have another brand of cutter. Manual die cutters are less expensive but you have to buy set dies. Electronic ones are more expensive but are more versatile. They can cut a wide variety of materials. I have been using mine for card making. I have started to explore using them for jewelry making (see my Halloween Bat Earrings Tutorial). Other jewelry artisans are using them for polymer clay and leather. Not just comforting but much more precise and reproducible! Finding out what was used to create these just cracked me up! However- I still haven't justified buying one of these machines but it's getting more tempting! You would love one of these machines for polymer clay work! More and more PC artists are using them!